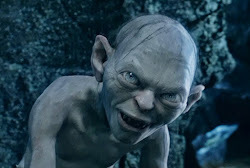 Smeagol has traveled through the wild a lot. Yes, very much. The Dead Marshes, Emyn Muil, Mirkwood, the Wold, many places. Many beasts we have seen, so we sings this song, The Lion Sleeps Tonight. We thinks it is some of our best work. Arda tells us we must "support" and "sustain" the long, high notes. We does it! We practices very much and does it well!